It was truly fortuitous. I was a joint JD/MBA student at Stanford in the mid-1970s and had a summer job for a company bringing an antitrust suit against IBM. I happened to have lunch with one of our lawyers the same day the president had asked him if $10 million would be a reasonable settlement. As our lawyer walked me through what might happen if we went to trial — “if the judge rules for us on issue 1, and the jury then finds for us on issues 2 and 3, and then believes our expert on issues 4 and 5, we’ll win a lot of money; on the other hand, if . . .” — my Decision Analysis course at Stanford came to mind. I started sketching the tree that fit his description of the twists and turns the case could take. Over the next few weeks, we worked with outside counsel to finish the evaluation, presented the tree and the results to the president, and the matter settled soon thereafter. 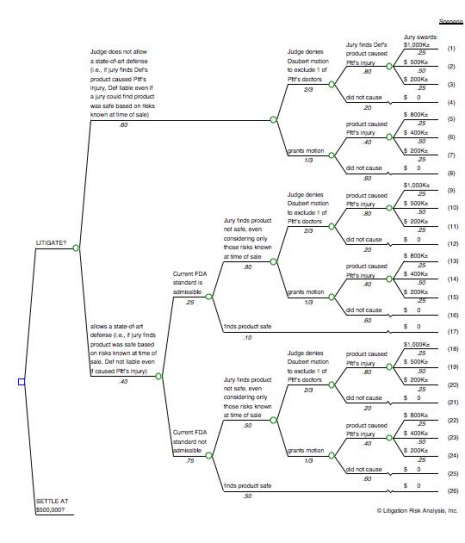 What are the primary ways lawyers and clients are using decision tree analysis in litigation? I believe there are a few ways: (i) to be sure the lawyers have a clearer understanding of the key issues, uncertainties and exposure presented by a case; (ii) to gain settlement authority from the client; (iii) to convince the other side to accept a given settlement; (iv) to persuade a mediator or settlement conference judge of the rationale of their position; and (v) to plan a cost-effective litigation strategy. Have you seen decision trees used effectively in mediation? I have been asked to present decision trees as an advocate in mediation, and it certainly helps show the mediator that my client and I have a reasoned basis for our settlement position. I have also been retained by mediators on several occasions in large cases to help the mediation process by getting the parties to agree on the appropriate decision trees, discuss arguments, and assess probabilities and verdict ranges. These cases have typically involved hundreds of millions of dollars, and by way of example include the $1.1 billion class action settlement of the Microsoft antitrust claims in California a few years ago. What is the mistake lawyers and clients most often make as they learn to use decision trees in litigation? The first is making just a one-node “we win overall/we lose overall” tree, and another is failing to do thorough “Lists of Reasons” before coming up with probabilities in the case. Let’s take each of those in turn. What’s the issue with a “one node” tree? And what do you mean when you say that some users fail to generate “Lists of Reasons”? As a case progresses, how often should the parties update their decision trees? The decision tree should be updated whenever there are new developments that would cause a significant change either to the structure of the tree itself (such as when a new cause of action is plead) or to the probabilities (because of what’s learned as discovery progresses, for example). In addition, it’s usually a good idea to review and update your analysis prior to making a settlement decision or prior to a mediation. Where can I find a good example of an advanced decision tree? And what is the mistake people most often make as their decision tree skills advance? As users become more advanced, I often see them putting multiple causes of action in separate trees when they should be in one tree or, if they know they should be in one tree, linking the causes of action together incorrectly. Either of these mistakes will cause the calculation of case value to be wrong. I also sometimes see them making trees more complicated — more academic — than they should be, forgetting that an effective decision tree should mirror the more streamlined, simpler approach juries often take when presented with complicated cases. If I have a working knowledge of litigation decision trees, do you have any tips on how to advance my skill set? I link to 7 articles on my website, and continue to offer training by appointment. In addition, I work as a consultant to counsel and their clients on significant litigation matters. Is there a software product out there you recommend? Come back next week for more of our interview of Marc Victor. You’ll be glad you did. Marc gave a lecture, probably one of many, to the Stanford Law negotiating class, when Bob Mnookin was teaching. I was also in Vancouver when Marc gave his presentation to the ABA Franchising Forum. My overall sense is that attorneys are comfortable with ordinal concepts of risk like: good, no chance, lock, and not so good. But, for the most part, attorneys resist being cast in the role of bookmakers – quite correctly in my opinion. I wonder if Marc shares my opinion about this being an important obstacle to use of decision analysis? Because there are certainly many obstacles! Thanks for your comment. You are right that it’s easier for lawyers and the rest of us to respond with concepts like “good, no chance, lock, and not so good,” but one of the key uses of decision tree analysis in my experience has been its ability to highlight the importance of a real risk assessment on a given issue — for example, “What’s our likelihood of winning summary judgment on our breach of contract claim?” I can’t take “not so good” back to my client, so I often use the decision tree as a collaborative tool to highlight to my counsel what hinges on each decision — what paths each answer might take us to. With that analysis we can consider, and arrive at, those probability estimates together. You’re right that we aren’t bookmakers, but as a client I don’t mind asking for a little more than “your chances are good” or “not so good,” either. I agree with much of what Marc said above, especially for large, complex, or high value cases. However, I’d add that one of the main barriers to adoption in smaller cases, other than what Michael Webster said above is the cost/benefit of performing a detailed analysis in a mediation context. In short, a detailed risk analysis is not always practical. Performing a detailed risk analysis can take a lot of time. In some cases, attorneys who use decision trees have said that the process has taken a half-day or more to really work through all the relevant issues. That can’t always be done in a smaller mediation. Because it takes so long, attorneys don’t want to spend the money, and mediators shy away from spending time using decision tree analysis. This also leads to the use of “one node” trees. I’ve seen mediators utilize this type of tree far more often than a detailed risk analysis and the most common reason I’ve heard for doing so is that its quick and easy to do. Thanks for your thoughts on this. My first reaction is that, if Decision Tree Analysis is the catalyst for a half-day review of a case (or even more), that might not be a bad thing. An hour-long debate about whether the expert’s testimony will be admissible or whether the fraud counterclaim has any merit has benefits in itself, and if the decision tree process encourages a detailed review of the case earlier in the dispute, so be it. That said, if the mechanics of mapping out the tree are an impediment in smaller cases, then by all means we should find an expedited workaround. I’ll take a look at PaperChace soon and pass along any thoughts I might have. I am a former student of Marc Victor’s and a big fan. I have successfully used decision trees to settle dozens of cases, primarily insurance coverage matters, using all kinds of trees, from relatively simple trees to trees with 10^75 hypothetical nodes (and which of course could only be mathematically modeled, not calculated). I have used them to convince opponents of the reasonableness of my client’s deal–from in-house counsel at a large multi-national conglomerate, who viewed themselves as God’s gift to the law, to the owner of a dry-cleaner who didn’t have a high school diploma. In every case I settled using a decision tree, the deal stuck and did not come unglued or get retraded, because both sides saw the value in the deal they made. Decision trees are amazingly effective, efficient and powerful tools to get parties to settle their differences. That said, I have been confounded by how often other lawyers have resisted the notion of doing a decision-tree analysis of their cases. Sometimes this is client-driven, but usually clients love decision trees. Rather, it is outside counsel that resist, generally on the ground that “the law can’t be reduced to a number.” These lawyers cannot be shaken from this view by any argument–that a decision tree is tool to aid judgment; that legal uncertainties, like every uncertainty, can be bounded by probabilistic parameters; that discomfort about “picking a number” can be addressed by picking a probable range of numbers (and performing a Monte Carlo simulation) or using sensitivity analyses. Instead, these lawyers would rather trust their gut. Don’t get me wrong: a lawyer’s gut is an great thing. But a well-focused, analytical, ordered and methodical gut is even better. And some of this resistance may be skills-driven. Doing a decision tree properly takes getting over a learning curve on the logic of the method, which for some may be steep. Doing a complex tree requires, in addition, facility with computer applications (either products like TreeAge Pro or Excel, for really complex trees). Not many lawyers are willing or able to acquire those skills. So more power to Marc Victor, John DeGroote and this blog. Hopefully the word will spread, and resistance will start to fade. It’s great to hear from one of Marc’s former students, and I appreciate the perspective you bring as a practitioner with years of advanced decision tree experience. I was fortunate enough to take a course with Mark Victor. At that time, I was one of four regional managers for a large commercial insurance company’s Staff Counsel program. We were so impressed with Victor’s aproach that we began to use it nationwide with both our law offices and claims offices. The majority of our cases were not huge complex ones, however we found that DTA was a very effective tool even on the run of the mill slip and fall cases. Often these were clear liability but the tree was useful in helping us value the dispute over causal relationship of the injury, etc. I agree that spending this time on analysis is not a waste. Once you have a good tree with estimates of probability on the real issues, it forms the framework around which reasonable minds can evaluate the value of a disputed matter. Thanks for your real-world perspective on Decision Tree Analysis, and let me know if you ever want to share some of the stories about how you used Marc Victor’s approach in practice. I’m sure our readers would really enjoy reading about them.